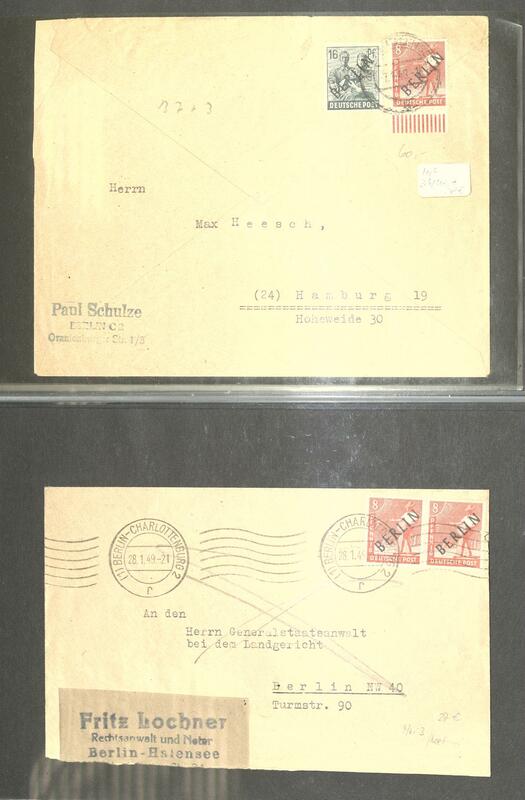 109 BERLIN - 1948 / 90, very nice mint never hinged collection, complete with all issued stamps in the KABE hingeless illustrated album. 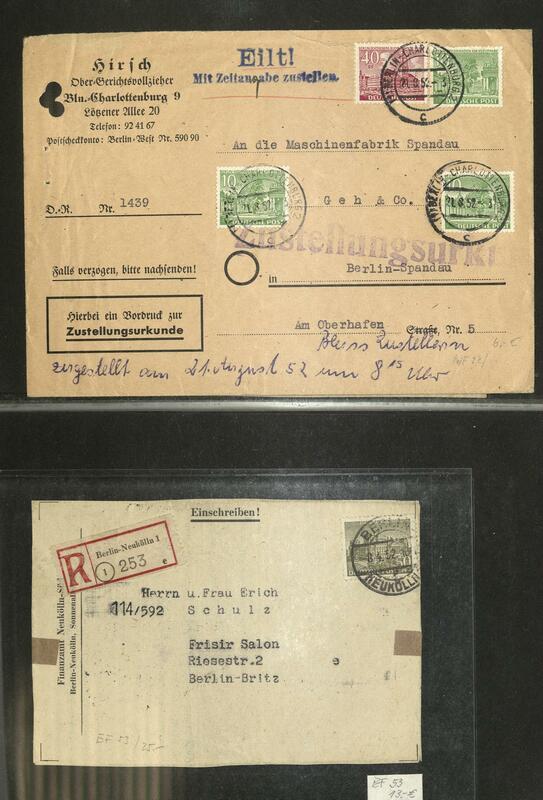 With also black overprint expertized Schlegel BPP, red overprint expertized Schlegel BPP, Stephan set, building set 1949, Goethe, green overprint expertized Schlegel BPP, monetary reform vitims set, monetary sovenier sheet expertized Eliades BPP and all further issues including bells issues, philharmonic, the C / D values and so on. A very nice object! Michel approximate 7600,- €. 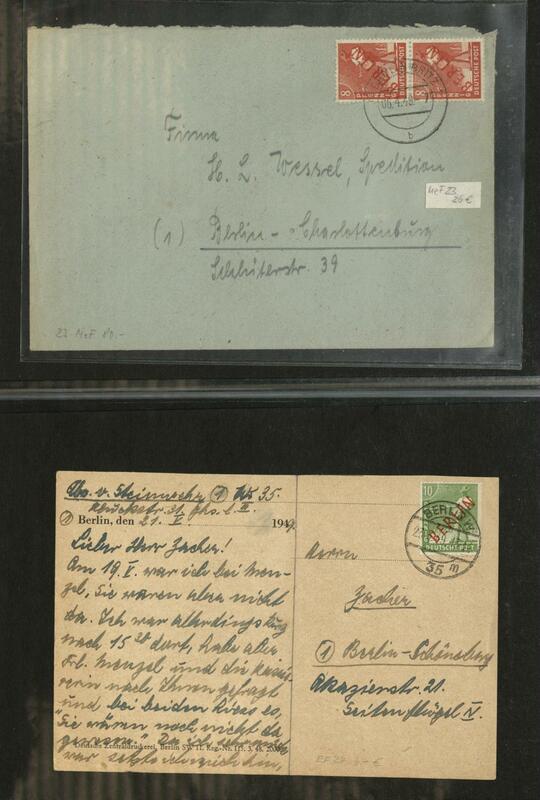 113 BERLIN - extensive mint never hinged inventory housed in four stockbooks, as well much interesting material, numerous upper margins including pairs with country inscription, some corners of the sheet with form numbers, se-tenants and stamp booklet abundant from buildings to sights and so on. Favorable valued inventory with gigantic catalogue value! 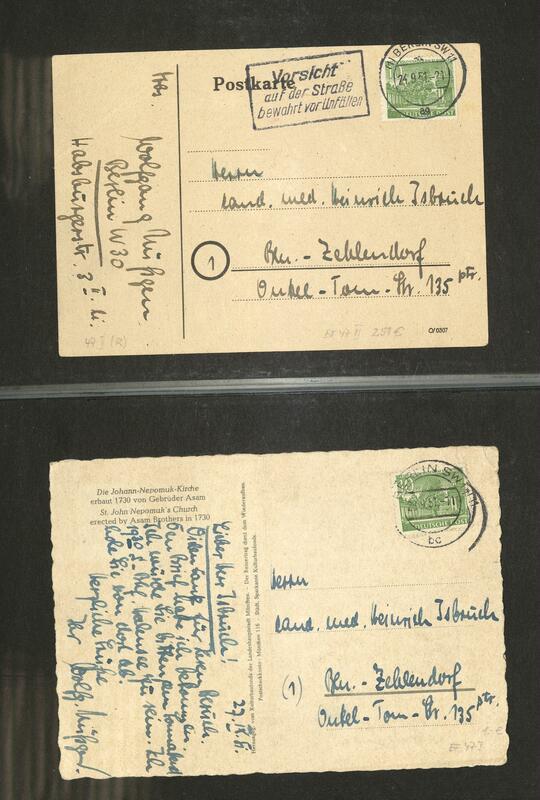 183 BERLIN / help for the Needy - interesting inventory from approximate 1000 mint never hinged help for the Needy surtax stamps, all in multiples respectively parts of sheets, as well perforated and imperforated values. Treasure trove for specialists! 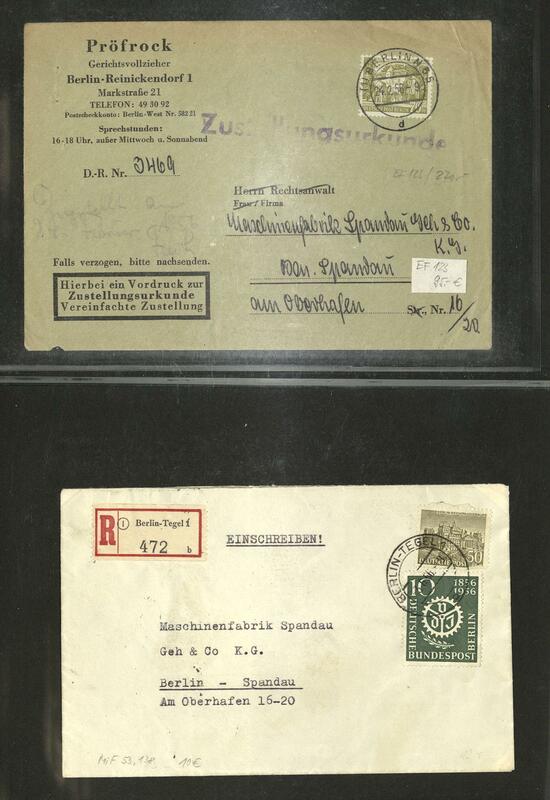 222 x BERLIN - interesting lot packed in a carton, as well good first issues including black overprint set, red overprint sentence, Stephan set, Goethe, monetary reform vitims set, all bells issues and much further material. Favorable treasure trove! 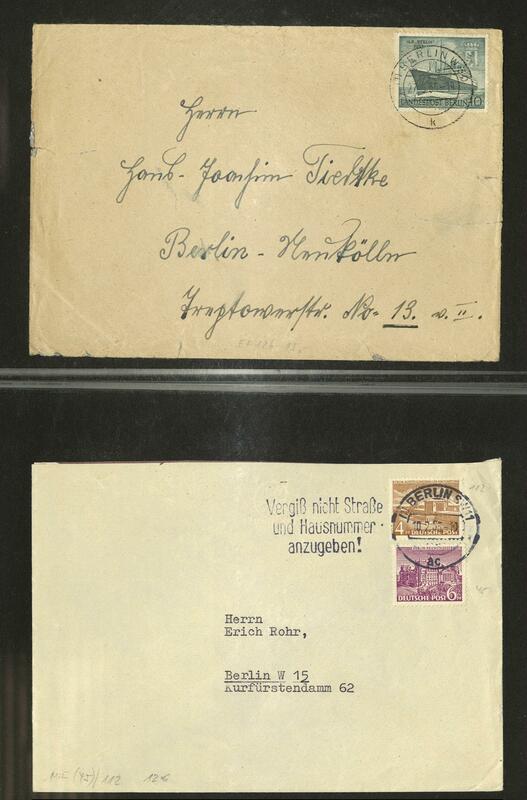 233 ✉ BERLIN - interesting lot of approximate 200 covers, cards and postal stationery from the beginning years, as well nice documents, interesting frankings and so on. 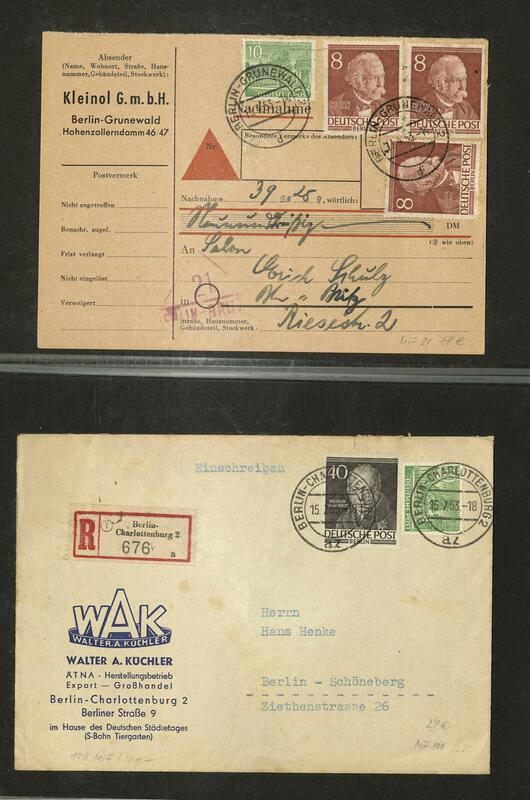 As for instance also ERP 1950 on special card, philharmonic 1951 on nice special card, 20 Pfg. 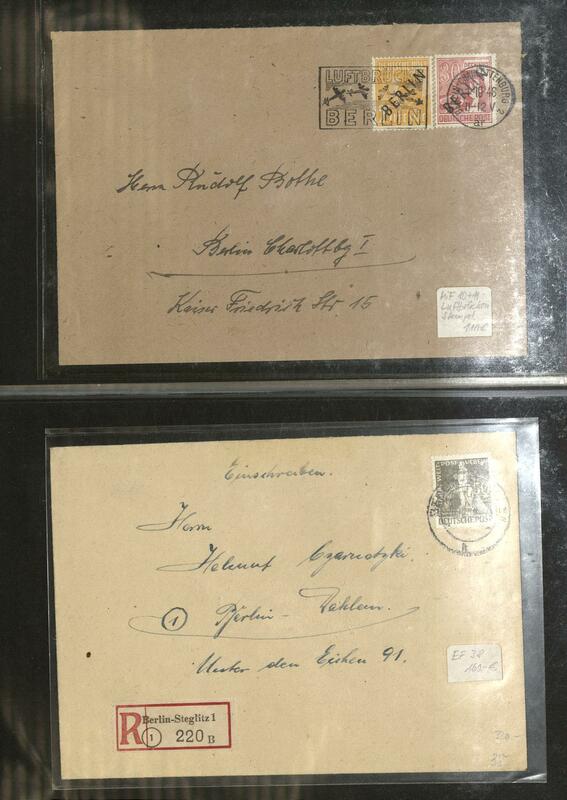 Goethe as correctly franked single franking on cover, various bells postal stationery and so on. Favorable! 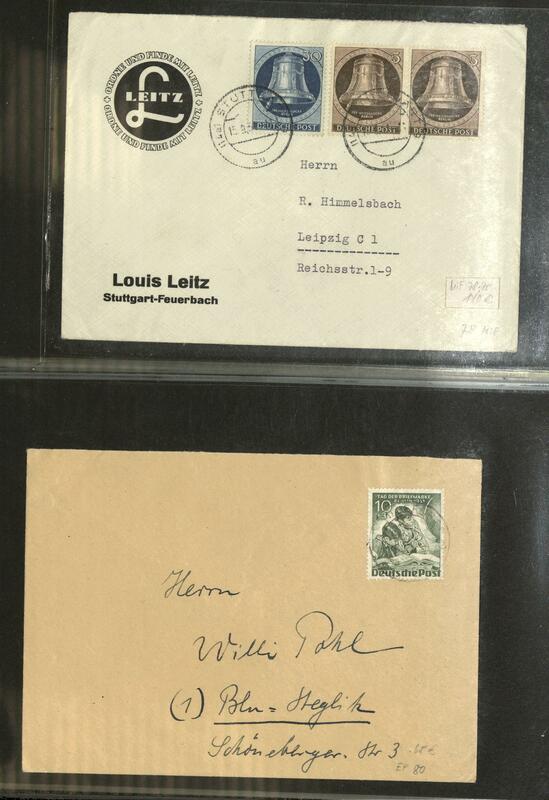 257 2010 BERLIN - 1960 / 90, nice mint never hinged inventory, in stock arranged in two large thick stock books, as well numerous special- and commemorative sets, welfare and youth sets and so on, whereby a great many issues 9 time are present. The collector has by the Michel-Catalogue 2010 meticulous a catalogue value from 11150,- €calculated. 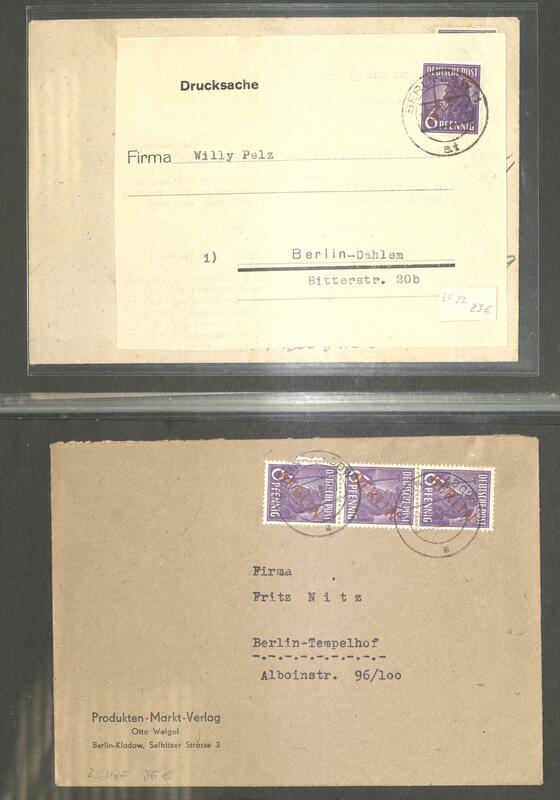 274 ⊙ BERLIN - 1950 / 90, superb used collection, nearly complete in the ring binder, many better issues including ERP 1950, philharmonic, Lortzing, all Freedom Bell sets, Day of the Postage Stamp 1951, memorial church, many issues with beautiful philatelic agency cancel, also coil stamp for vending machine and so on. Michel approximate 2600,- €. 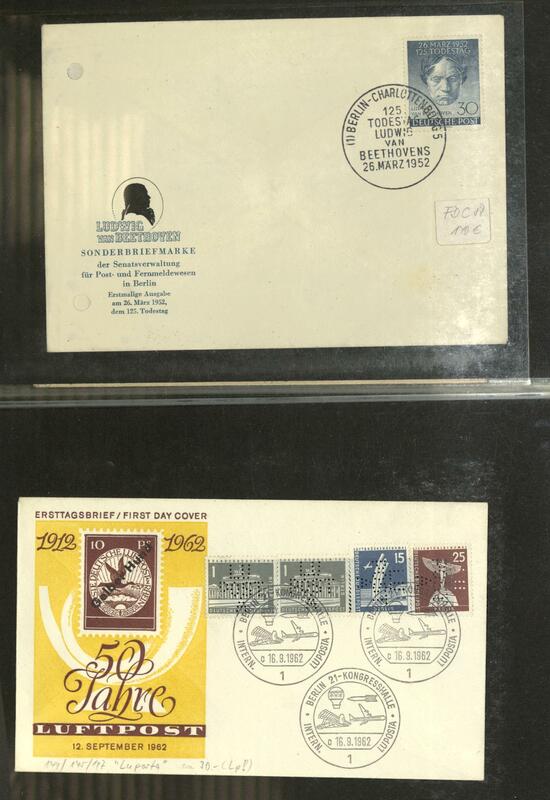 275 BERLIN - 1965 / 71, nice mint never hinged collection from complete original sheet in the sheets album accommodated, as well special- and commemorative issues, as well welfare and youth sets. In total are 71 various sheet available. Very high catalog value! 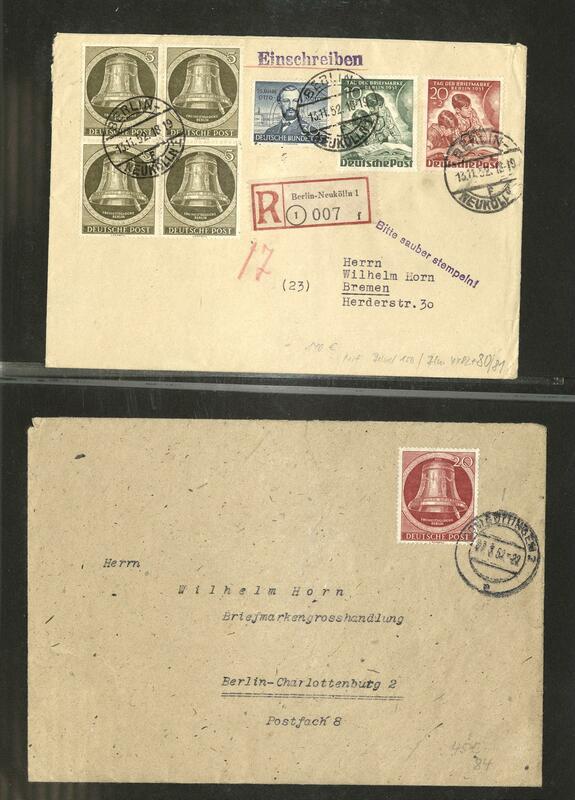 301 ✉ BERLIN - 1950 / 87, rich collection nice illustrated First Day Cover in the ring binder with numerous sought-after issues, with also ERP 1950, Day of the Postage Stamp 1951, Beethoven 1952, Before Olympic Games 1952, eight different values the men issue 1952 / 53 on six illustrated First Day Cover, 10 Pfg. And 20 Pfg. Memorial church, 17. 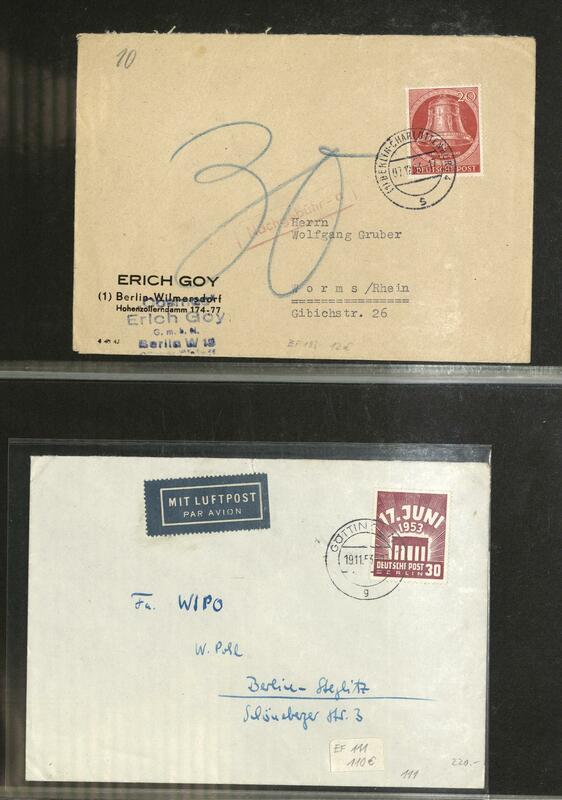 June 1953 and many further popular issues, with also 3 DM congress hall on First day card with attest Schlegel and so on. Very favorable! 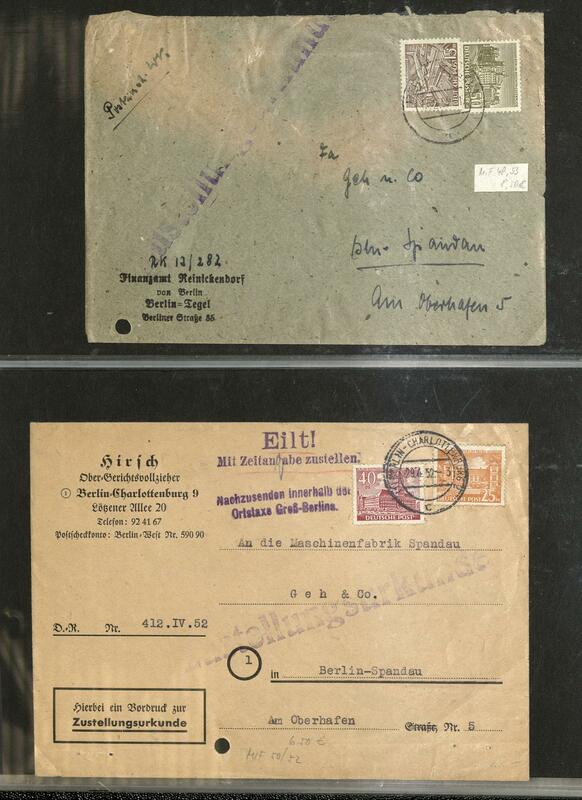 331 ✉ BERLIN - extensive lot of approximate 400 covers packed in a carton. 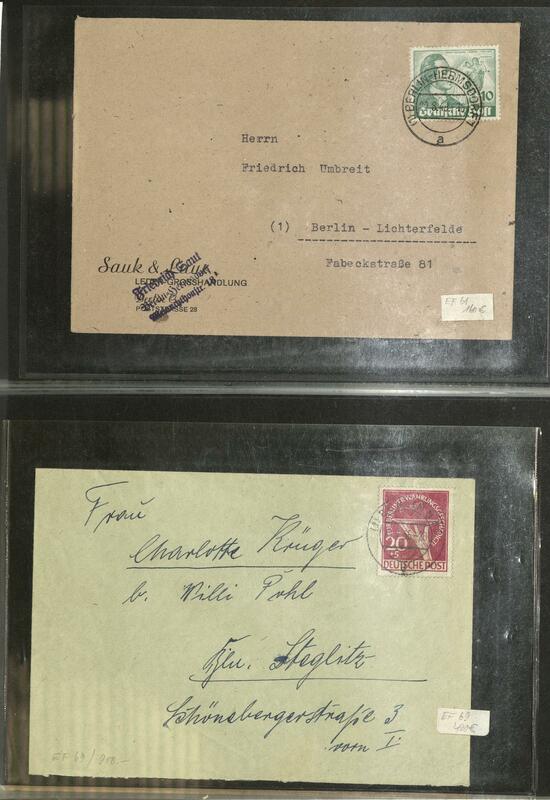 Many nice documents, interesting frankings, numerous registered, single frankings, different use form and so on. Treasure trove! 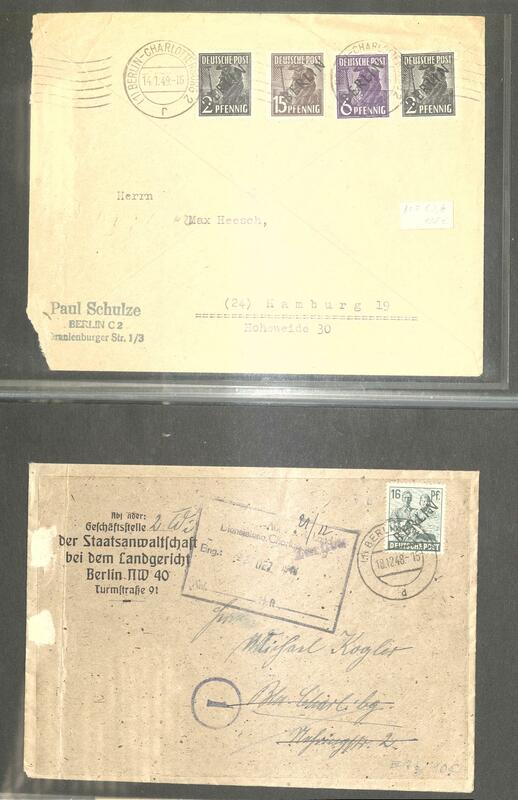 339 /⊙ BERLIN - interesting and extensive lot in the ring binder accommodated, predominantly se-tenants, stamp booklet panes and stamp booklet, many various issues, also an extensive part sights, furthermore also postal stamps with horizontal pairs and margin copies. Delightful inventory with enormous catalogue value! 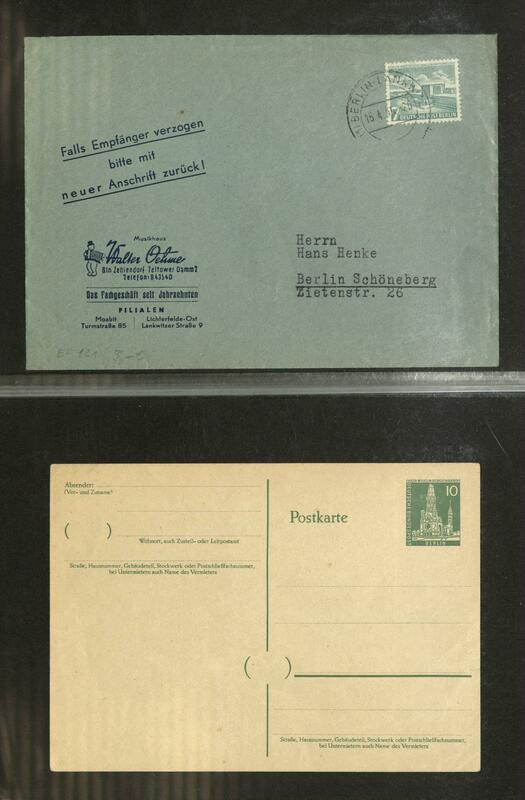 402 /⊙ BERLIN / stamp booklet - very nice and extensive lot stamp booklet from Brandenburg Gate to sights in the ring binder accommodated. 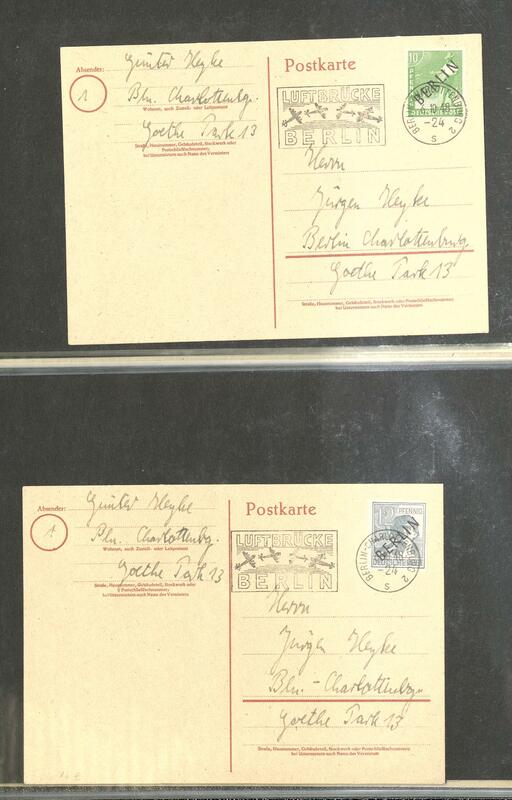 As well it concerns an mainly about mint never hinged issues, from the both sights stamp booklet are also neat cancelled examples available. A very nice and extensive inventory, the be in the best way to the liquidation is suitable! Michel approximate 6800,- €. 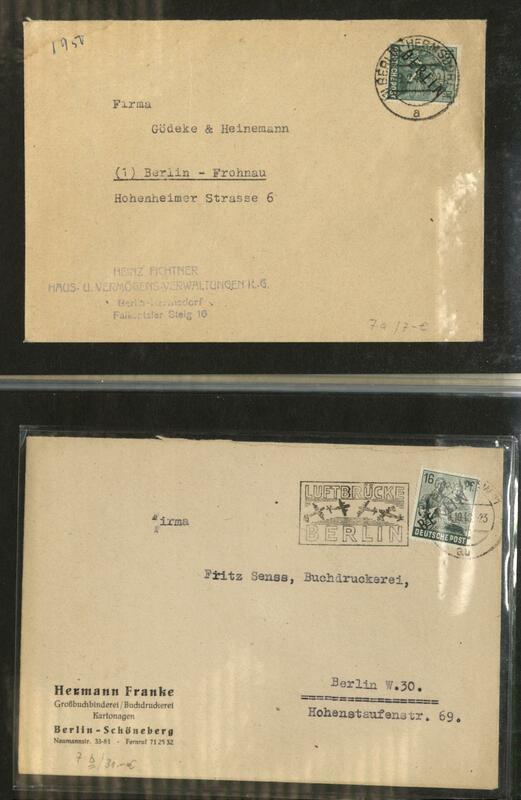 405 /⊙/ BERLIN - 1948 / 90, rich collection in the Lindner ring binder, except for few issues complete. 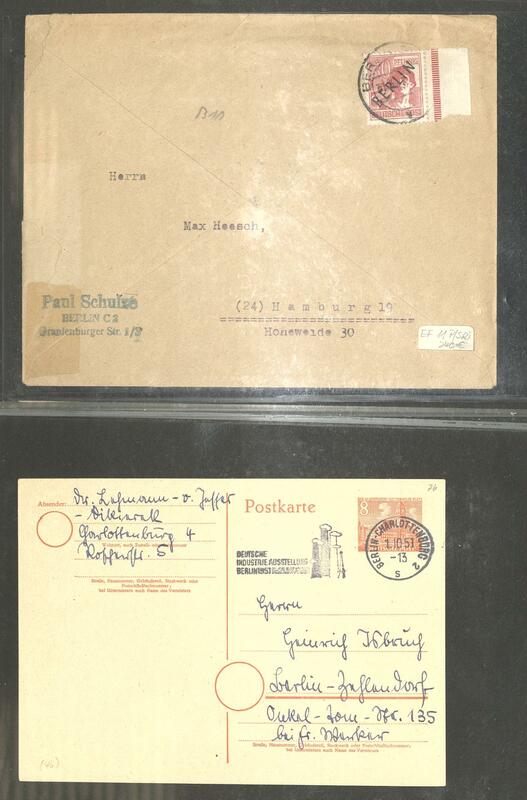 Included are also black overprint 1948, Stephan set, Goethe set, philharmonic, all bells issues and nearly all further issues. Very favorable! 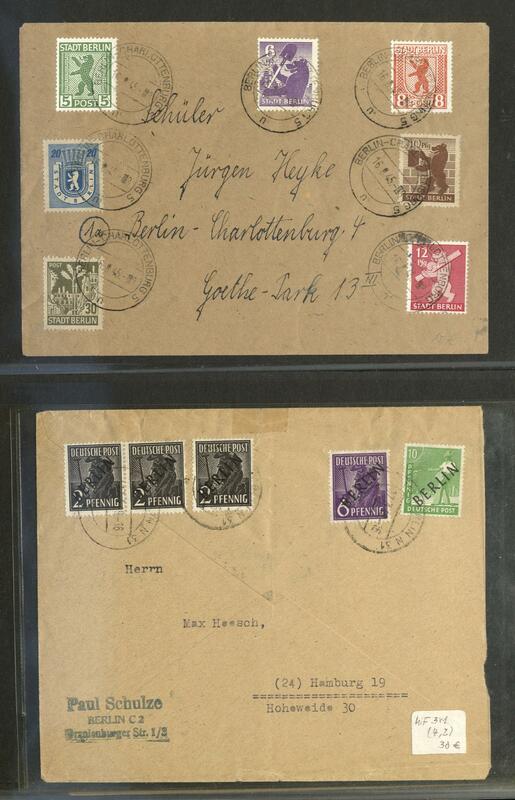 409 ⊙ BERLIN - extensive used lot in stock created from 1948 in a large stockbook with only issues of the forties and fifties. As well numerous special- and commemorative values and so on. 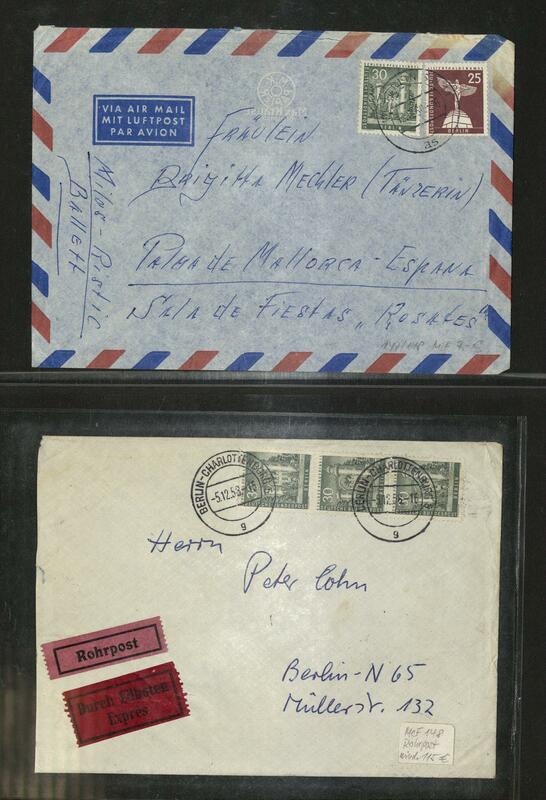 The collector has a catalogue value in the nineties years from approximate 7600,- DM calculated. 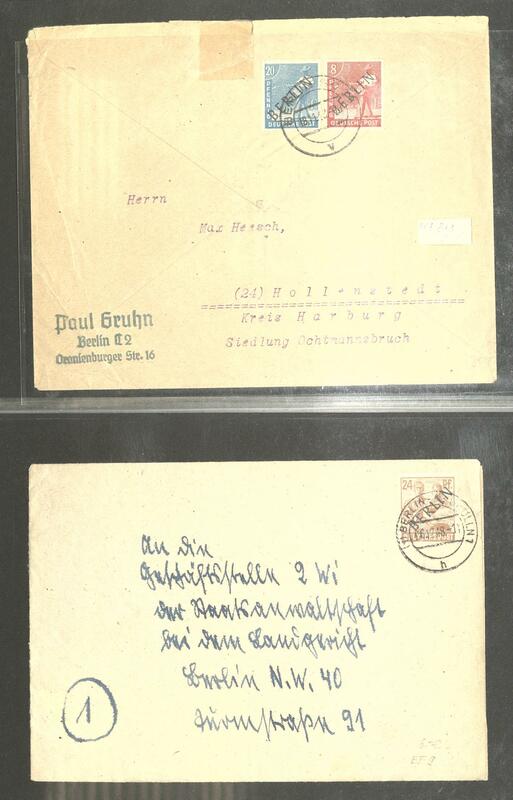 418 x BERLIN - extensive lot packed in a carton with a large number from issues on stock cards mint never hinged respectively used, as well numerous complete sets, from the beginning years, including Goethe set, memorial church and so on. Enormous catalog value! 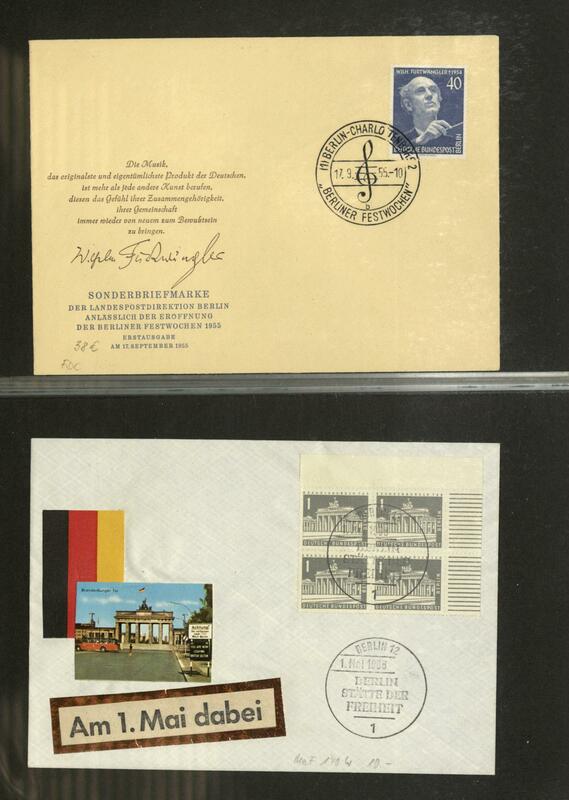 443 FDC BERLIN - extensive inventory from approximate 1000 documents, almost only illustrated First Day Cover from the sixties years to 1990 packed in a carton. With also numerous welfare and youth sets, special- and commemorative issues and so on. Huge catalogue value! 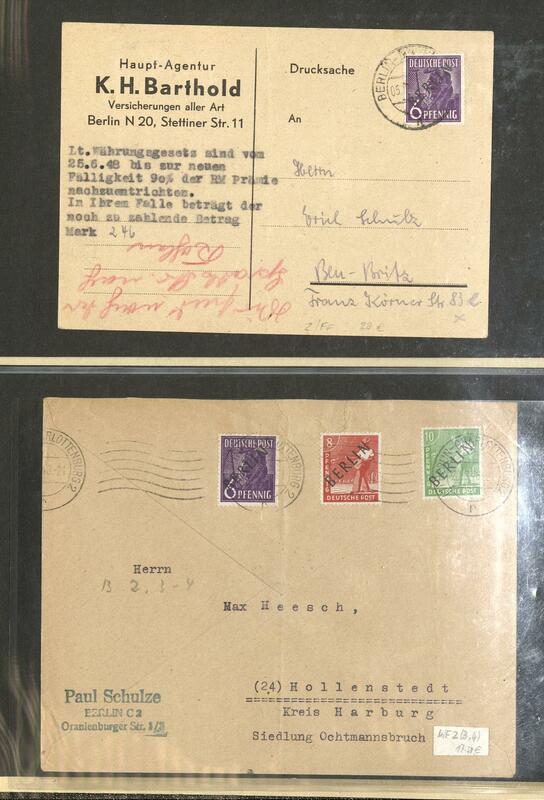 468 ⊙ 18/20 BERLIN - 1948 / 90, extensive used collection in the lighthouse hingeless illustrated album. 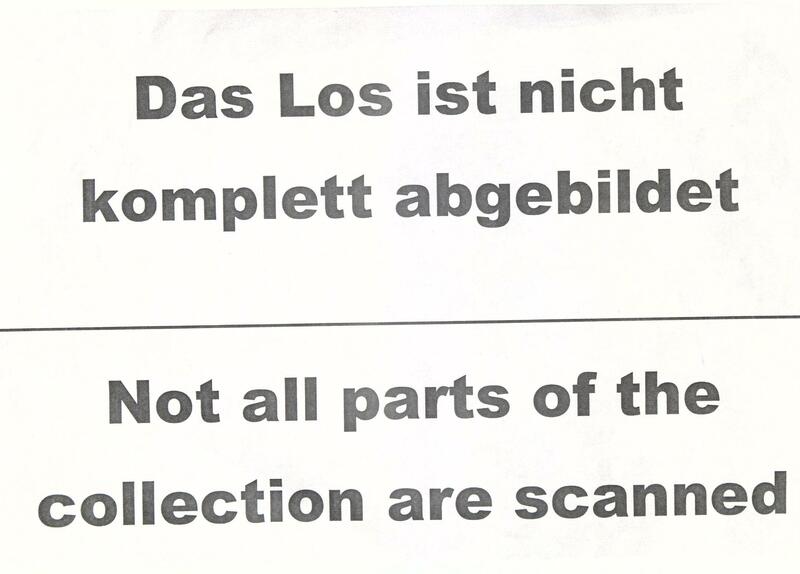 The collection is except for Michel no. 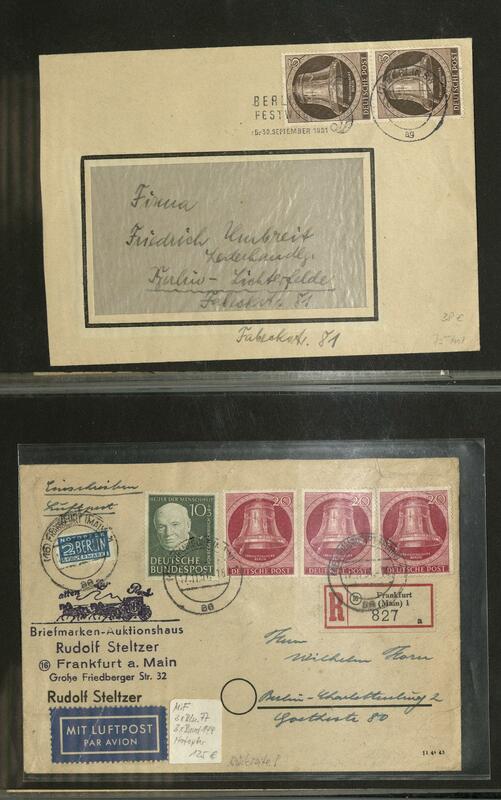 18 / 20, 33, 68 / 70, souvenir sheet 1, C / D values and coil stamp for vending machine complete including Stephan set, Goethe set, philharmonic, all bells issues, Day of the Postage Stamp 1951 on beautiful letter piece with special cancel and so on. Michel approximate 3700,- €. 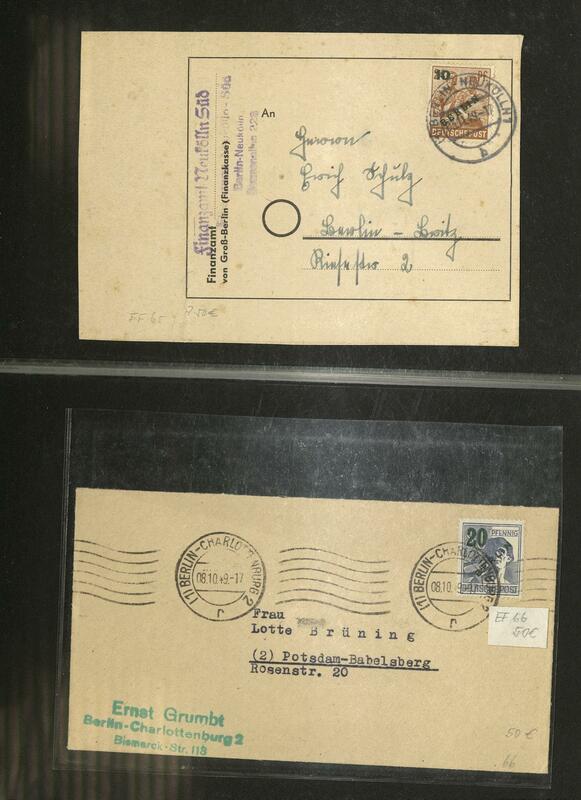 493 /⊙ BERLIN - 1948 / 90, rich collection, predominantly mint never hinged formed in two Lindner ring binder. With also many complete years, se-tenants, C / D values, coil stamps and so on. Michel approximate 2000,- €. 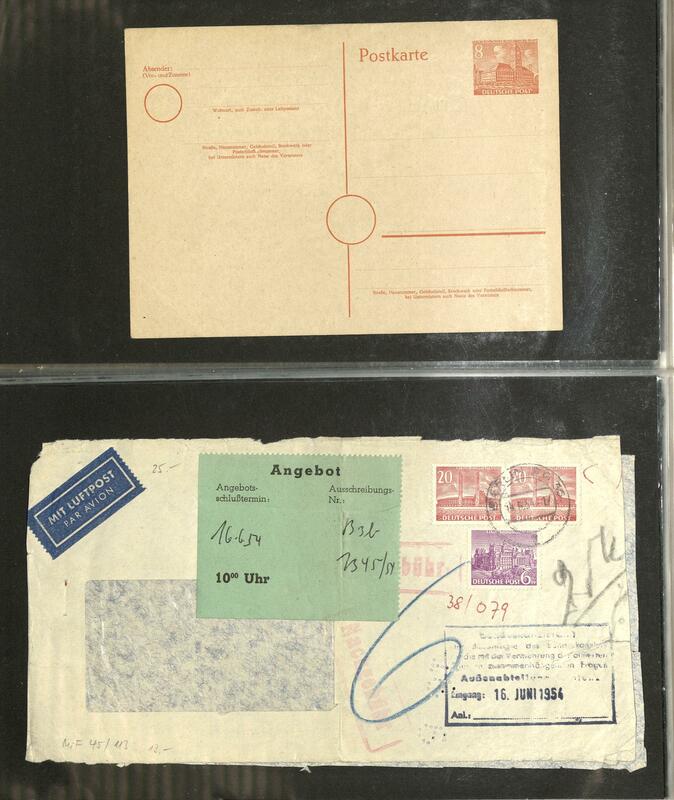 504 ⊙/✉ BERLIN - 1948 / 90, extensive used collection in two Lindner hingeless printed form ring binder with plenty of better issues as for instance 2,- DM red overprint expertized Schlegel BPP, Stephan set, Goethe set, 10 Pfg. 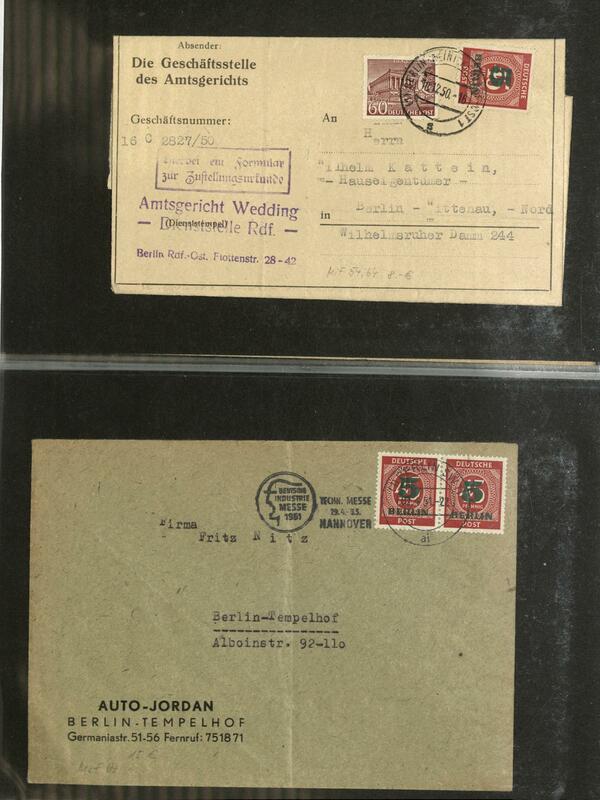 Monetary reform vitims on special card \"700 years WEDDING 1951\" with appropriate special cancel, all freedom bell sets, philharmonic, Day of the Postage Stamp 1951, Lortzing centric cancellation, memorial church, many complete years and so on. A magnificent object! Michel approximate 3600,- €.